Experience the complex majesty of the Book of Revelation brought to life in this powerful and sensational two CD set. 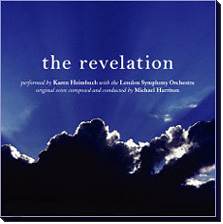 The Revelation is a dramatic presentation of the unabridged New International Version of the Book of Revelation performed by Karen Heimbuch. A completely original symphonic score, written by Michael Harriton and recorded with the world-renowned London Symphony Orchestra, vividly punctuates this magnificent work of art. The Revelation is a worship encounter like you’ve never experienced. SPECIAL OFFER: Select the Promo Package to receive 1 FREE with every 4 purchased! 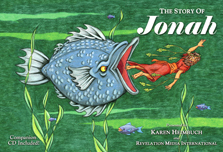 The Story of Jonah is timeless, with profound lessons in the love and mercy of God toward all, and the resultant forgiveness that God expects us to show others. The text is taken directly from the New International Version of the Bible, with vibrant and engaging illustrations from veteran Warner Brothers animator, Burton Medall. 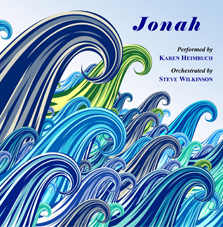 This book’s companion CD includes Karen Heimbuch’s dynamic delivery of the story with the captivating orchestral background by Disney composer, Steve Wilkinson. 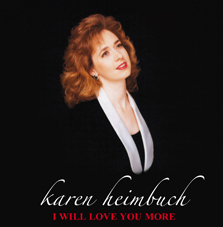 In 1993, Karen had the joy of recording some of her own music. This CD delivers practical insight into the believer’s heart of worship. Your soul will be refreshed by this enduring collection of original compositions. Produced by renowned jazz artists PeeWee and Michiko Hill. 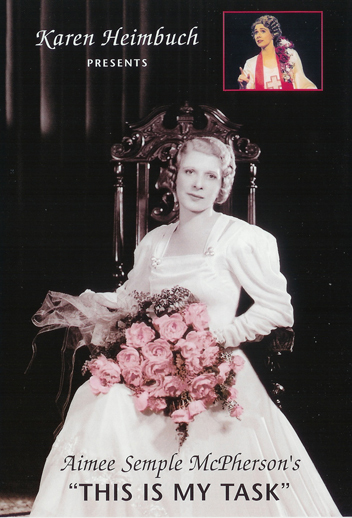 During the years between the two world wars, Aimee Semple McPherson ministered to massive crowds that packed out the largest tents and auditoriums around the world. Countless thousands put their faith in Christ, and thousands more experienced miraculous healing. Aimee built Angelus Temple, began a Bible institute, and founded a denomination that presently reaches nearly 150 countries with the Gospel. On March 12, 1939, Sister McPherson preached one of her many timeless messages at Angelus Temple entitled, “This is My Task.” Experience this message word for word, inflection for inflection, as Rev. Karen Heimbuch portrays Sister preaching this sermon. This service was recorded live during The Conference on Spirit-Filled Living, held at The Church On The Way, in Van Nuys, California, on June 13, 1998.